The Old Bank B&B in Limerick has become my family’s ‘home away from home’ in Ireland – rarely does a year pass when we don’t make a visit. I’ve updated this post from our first visit in 2012 as this B&B continues to be a favorite for our readers and vacation coaching clients. Though Bruff is only about 30 minutes from the town of Limerick, where our friends Eoin and Saša live, it is not well signposted. So let me advise you, right off, to do what I didn’t and get the directions off the website. Because once I share this gem, hidden in the southwestern part of County Limerick, you will want to visit. The Old Bank is termed a luxury B&B. But before that makes you stop reading I want to let you in on a little secret. Miriam has four little ones of her own- the youngest born just 3 days (!!!) before our arrival. My daughters immediately ran off with Miriam’s girls, and Miriam and I settled in for a chat. As the name implies, the B&B is located in an old bank. Photos of the building when it was purchased show a dilapidated interior which is unimaginable as you relax in the timelessly decorated sitting room. As Miriam explained the time, planning, tears and elation that went into this magnificent dream of her family’s, I was amazed at her strength- she’s a feisty one! Miriam is also a people person. She takes the time to give both a heartfelt welcome and a proper farewell. If you have any questions about the area, or need recommendations on what to do, Miriam can advise and even arrange activities. If rain ruins your plans, a comfortable chair waits in the sitting room and Miriam’s wall of books will keep you entertained for hours (begin reading the Lough Gur series by local author Michael Quinlan – you’ll want to pick your own up at the Lough Gur Heritage Centre.) The wifi is strong here and there are few better places to spend a wet Irish afternoon. The beautifully appointed, spacious rooms continue the feeling of luxe comfort. Our deluxe room contained a twin bed, and a double – with another twin bed brought in to accommodate our group of 4. A desk, amoire and dresser easily held our belongings, and we still had lots of room to move about. The bathroom, easily half the size of our large bedroom,featured a whirlpool tub- which we all delighted in! For a mere €10-15 more, splurge on a Superior room. Not only breathtaking, but private. Having a family, Miriam knows the value of hotel rooms that connect. 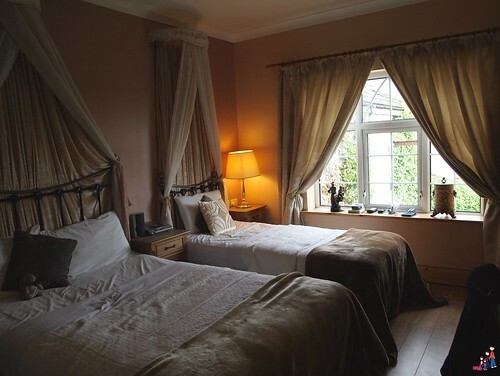 So she made sure that a few of her rooms do just that, making this one of the best B&Bs for a family vacation in Ireland. 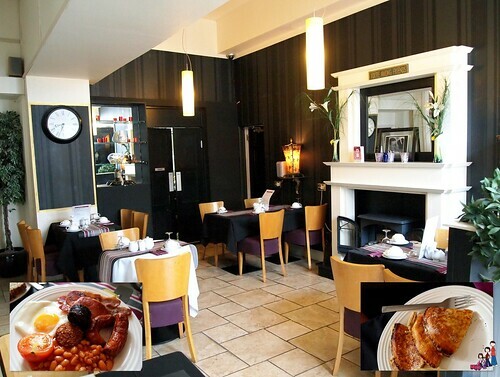 With the feeling of an intimate restaurant, the breakfast room is casual elegance. The beautiful sideboard features half a dozen cereals, milk, juice, fruits, pastries and bread, the kids have no need to even glance at the breakfast menu. In addition to the Full Irish, Miriam also offers an incredible pancake. Made in a large cast iron pan, there is plenty to share. 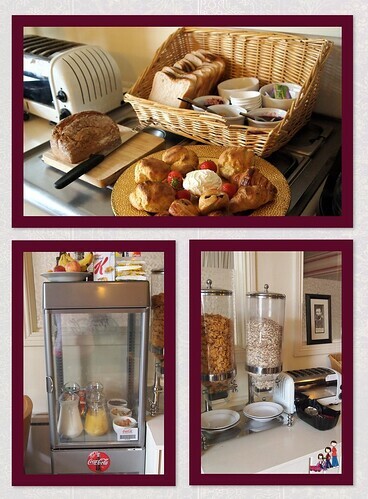 You’ll want to take advantage of the hearty breakfast because Bruff is surrounded by terrific, fun family activities. From the mystical Lough Gur, with its faerie cave, giant’s grave and ghost to the outdoor activities of the Ballyhoura Region, you’ll keep busy in this ‘hidden area’ of Ireland. The nearby Donkey Sanctuary is a must for fun family vacations in Ireland; children and adults will be entranced by these loving, gentle creatures. Bruff is approximately 25 minutes from Limerick, 45 minutes from Shannon and 2.5 hours from Dublin. I would return each year too! So charming! I really do need to get myself to Ireland. ASAP. Yes, you do! When you’re ready you just let me know! This looks like a dream come true! Wow. I can see why your family returns each year. Hope we get to stay there when we finally make our Ireland trip! Hello Jody! Just read your description of Old Banks B&B. Yes, let’s plan for this as a stay! Thank you for these great tips! Our family is moving to Limerick for 1 year and will all the help we can get planning in advance some kid-friendly activities and trips. I’m definitely adding a stay at this B&B to the list. So glad you are finding Ireland With Kids helpful! Please let me know if I can answer any questions for you! And be sure to tell Miriam you read all about her wonderful B&B here!